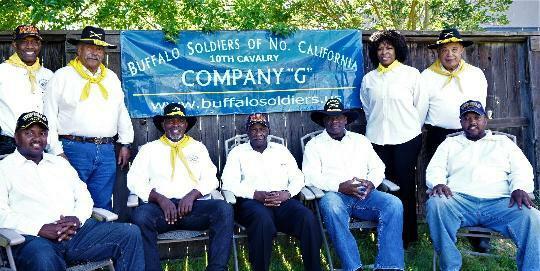 We are the 10th Cavalry, Company G of Northern California a Buffalo Soldier a living history group. Established in Sacramento in 1992. We re-create a Buffalo Soldier Company during the Indian Wars Period the years from 1866 to 1891. The year our unit concentrates on is 1874. Buffalo Soldiers were members of the US Army and wore the same uniforms as the rest of the U.S. Army. They were initially given left over uniforms and equipment from the Civil War. That was the regulation uniform when the Ninth and Tenth Calvary were created by an act of Congress in 1866 after the end of the Civil War and troops were needed to return to the west that had become lawless during the Civil War. Later differences were a result of the delivery times. New uniforms and equipment were delivered in the order of the regiment (IE: 1st Cavalry received the first shipments, then the 2nd, etc.) That meant the 9th & 10th Cavalry (Buffalo Soldiers) received their uniforms and equipment after the other 8 regiments of Cavalry received theirs this was also true for the 24th and 25th Infantry units also created in 1866. This meant that it was usually about 4 years after a new uniform regulation came out before it reached the 9th Cavalry, 10th Cavalry, 24th Infantry and 25th Infantry Regiments. Our Troopers have authentic and reproduced equipment from the period of 1866 to 1891 that is available for view and will be described. Co G's goal is to tell the story of the Buffalo Soldiers as accurately as we can. We obtain factual information of the Buffalo Soldiers in the Cavalry during the Indian Wars years and after. We wear the official uniforms and use equipment that was issued to the Black Cavalry troopers. Our horses are the only issued item we cannot duplicate. The ones issued to the black troopers after the Civil War were often the worst of the worst. We can setup an authentic campsite with our horses, tents, camp fire and cooking utensils. We display a stuffed Buffalo Head for photo opportunities for folks that come and see our display. We tell the story of not only the 10th Cavalry, but how people of color were first recruited into the military. There are many, many stories about Buffalo Soldiers, some true and some not. U.S. Army records that are now becoming available, are well documented and we can now give truthful information. There is now a flood of information available and can be obtained from groups like ours and on the internet. We travel to parts of Northern California - Schools, Organizations and to anyplace that wants our appearance for events to help us tell the real story of the Buffalo Soldiers. We need fuel to get there and feed for the horses if they come too. With the constant increases in those costs we never know what it will cost for our appearance if any.